The Derby City Classic survived a change in venue - and a brutal ice storm - to prove why it's still pool's wildest party. It wasn't easy, that's for sure. The 2009 Derby City Classic faced plenty of obstacles, some real and some rumor. The national economic situation was growing increasing bleak. For the first time in its 11 year history, the Louisville-area convention of professionals, hustlers, sweators and everything in between strayed from the Executive West, jumping over the Ohio River to the decidedly more sanitary setting of the Horseshoe Casino in Elizabeth, Ind. Speculation grew that the new venue wouldn't be accommodating to the heft of the after-hours action, instead trying to funnel all the free floating dollars to its blackjack tables. Oh, and just two days into this year's festivities, a crippling winter storm plowed through the Midwest, closing roads across Kentucky and Indiana while leaving hundreds of thousands in the area without power for days. Despite all the reasons for this year's revelries to be muffled, Derby City was still raucous. 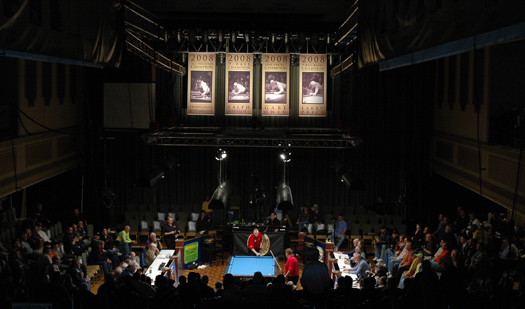 For all it's unpredictability, it's ability to produce unique moments, and everything that happens when you get a few hundred pool players together and sequester them in Middle America for nine days, the 2009 Derby City Classic was, well, normal. And what many thought was a trial run at the Horseshoe Casino allowed the Derby City founder Greg Sullivan to breathe a little easier after the final ball was pocketed. "The main thing I can say is that we got through it," he said. "And we did continue it."